I will be the first to admit it: the older I get, the crankier I get. I try to keep a positive attitude about life in general, and about my beloved crochet in particular, but there are a few things that get me fuming. So please excuse me while I vent a little bit. Of course, we all get asked "What are you knitting?" I try to look on this as a chance to introduce the lovely art of crochet to a person who is simply uninformed. And I actually consider it a compliment when someone says to me "You crochet? My grandmother did that!" It is a little more irritating to be told "Oh, wow, you crochet? That is a dying art!" But still, I tell myself, it is an opportunity for me to educate others about the art I love. But I HATE it when an editor or copy writer thinks they are making a book or pattern sound cool or hip by saying "This is not your Grandma's Crochet!" I have found this usually means that the patterns in question are about as ugly as a mud fence, and most grandmas would just be embarrassed or confused by them. I almost called my company "Grandma's Crochet," when I was trying to come up with a name for BellaCrochet back in the 90's, which tells you how long some people have been using this aggravating phrase. 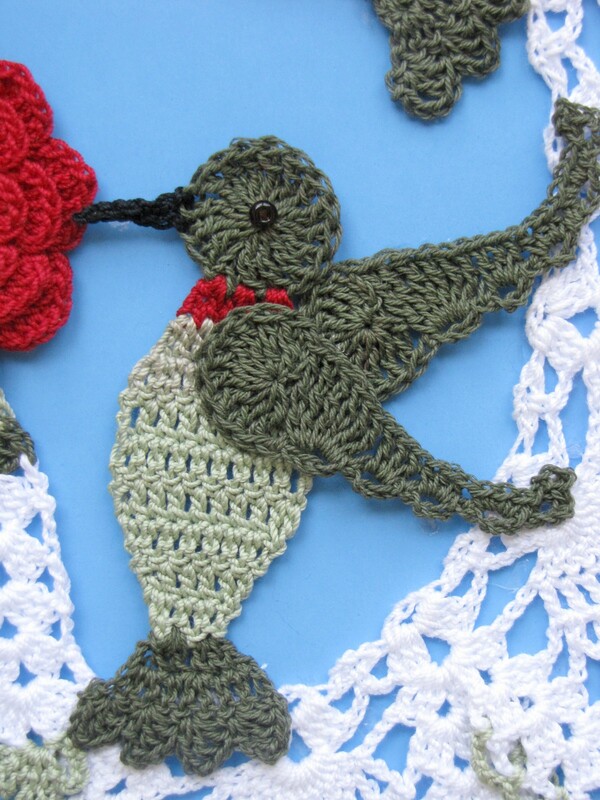 "I like your doily pattern, but I really just want the pattern for the hummingbird. Can you sell me just that part of the pattern? And how much would you charge me for it?" The answer? I do not break up my patterns. It would take way too much time to do so. First, I would have to make copies of all of the pieces of the specific part of the pattern that is wanted and start a new document. Then I would have to edit the Materials list, Special Stitches and Finishing instructions and add them to the new document, then create a new pdf and then do a special listing for the new pattern. I have spent many hours getting the complete pattern just right in the first place, and it only costs $7.95. So, no, I will not sell just a part of a pattern. Unless you are willing to pay me $25.00 for it. The second thing that really bothers me as a seller is getting a message that says "Oh, please cancel this sale and refund my money. I thought I was buying a finished doily, not just the pattern." Each one of my designs is clearly listed as "PDF Pattern" and takes many, many hours to complete. And they think they are getting a finished doily for $7.95? With free shipping? Please!!!!!! And then there is Ebay. I cannot tell you how many Irish roses I have seen that were photographed upside down. I always want to send the seller a message saying "turn it over, Dummy!" But I never do. Isn't it obvious that it is upside down? I guess not. But anyway, thanks for letting me vent, I feel better now. Do you have any pet peeves when it comes to crochet? It drives me nuts to see crochet items displayed upside down..esp. in a pattern book. Goes to show most editors do not know the craft. I don't sell on ebay because most of the doiies are priced to cheap and it makes it hard to get even your thread price back if you use good quality thread. I hope you continue "ranting" I say go girl! lol I too can relate, it is sometimes irritating to hear that familiar, oh are you crocheting? I brought my crochet to to a Super Bowl party at a club's member's house. Since I do not care for football but love the commercials I felt it a good time to catch up on a project. And I got, from the members, oh and then laughter, your knitting....NO I AM CROCHETING.... I wanted to shout!!!! While I am not a designer and can't really relate to seeing your designs classified as "antique" you have made me wonder if I should check ebay to see if anything I've sold is being resold as antique. As for the upside down rose, my wife (who has been crocheting longer than I) often get back from front mixed up but I think even she would be able to pick that one. Oh I hear you!! I hate it when people sell there 'handmade' clothing with an upside down doilie on them. Makes me wonder about the seller - how can they not tell! I hate upside down doilies and not being able to get a good price on eBay. Someone once told me that no doily was worth more than $20 Argh! I also hate when you use the correct gauge and the pattern says finished size will be 17" and you can barely squeak it out to 12" after blocking. Thanks for letting us vent, too! It also irks me to see a doily displayed upside down. I have seen many of my doilies that I have given to friends displayed on a table or stand with the roses clearly showing the back side. Then I think oh well, if they cannot tell the difference it must also look pretty good on the back too. And I will agree about the doilies on ebay selling so cheap. A few of us had a nice few years where we were getting a decent price and sometimes more but then the market went to pot because of the low prices offered. Needless to say none of us are on there anymore. Upside down seems to be a pet hate of all crocheters, another for me is the reference to hand made crochet stretch head bands, when obviously they are mass produced made in china. I know how you feel. I hate to hear somebody say "It's not your grandma's crochet" like there was something wrong with grandma? A lot of the young people today could learn a lot from us grandma types. I can't believe people would ask you to sell them just a portion of the pattern! That's one I hadn't heard before. I wonder in blogland and come across your post by chance...it made me chuckle. It is obvious that the Irish Rose is up-side-down. HI! i just landed into your blog days ago, and i'm reading it, you have some serious crochet! (this is a compliment!) your work is fantastic! it drives me crazy upside down crochet photos... especially in a magazine! I crochet since 6 yrs. I'm 41 now and i'm used to hear things like "oh, do ANYONE STILL CROCHET?? That's granma's stuff" imagine when I was twelve and made all my doll's clothing! I think we are special people (we crocheters) 'cause many people around us are showing interest and want to learn to crochet! I found your blog a few days ago and I just LOVE it. I can so sympathize with this post on a crocheter's pet-peeves. It really drives me crazy when someone asks what I'm knitting ("nothing." I answer, "I'm crocheting") another one of my pet-peeves is when someone tells me that knitting is prettier than crochet.